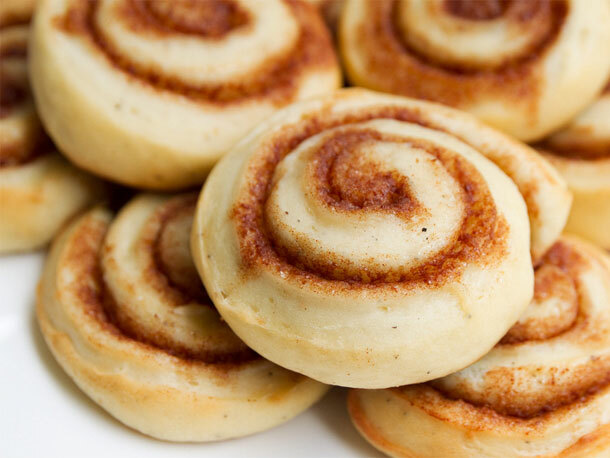 cinnamon roll (also Coffee scroll, cinnamon bun, cinnamon swirl and cinnamon snail) is a sweet roll served commonly in Northern Europe and North America. Its main ingredients are flour, cinnamon, sugar, and butter, which provide a robust and sweet flavor. In some places it is eaten as a breakfast food and is often served with cream cheese or icing. It consists of a rolled sheet of yeast-leavened dough onto which a cinnamon and sugar mixture (and raisins or other ingredients in some cases) are sprinkled over a thin coat of butter. The dough is then rolled, cut into individual portions, and baked. In North America, cinnamon rolls are frequently topped with icing (usually confectioners' sugar based) or a glaze. In Northern Europe, nib sugar is usually used with a glaze instead of icing. In Sweden, the country of its presumed origin, the cinnamon roll takes the name of kanelbulle (literally: "cinnamon bun"), and October 4 has more recently started to be promoted as "kanelbullens dag" (Cinnamon Roll Day). Swedish kanelbulle dough typically also contains cardamom (powder or buds), giving it a distinctive flavour. A German variety originating in Hamburg and its surroundings is the Franzbrötchen, a cinnamon pastry inspired by the non-cinnamon French croissant. The size of a cinnamon roll varies from place to place, but many vendors supply a smaller size about 2.0 in in diameter and a larger size about 10 centimetres3.9 in to a side. The largest variety can be found in Finland, called Korvapuusti, where it can be up to 7.9 in in diameter and weighing 200 grams. A honey bun is a sweet roll similar to the cinnamon bun that is popular in the southeast United States. "A honey bun is a fried yeast pastry that contains honey and a swirl of cinnamon in the dough and is glazed with icing. According to legend, Howard Griffin of Griffin Pie Co. in Greensboro, North Carolina, developed the first honey bun in 1954. Flowers Foods acquired Griffin Pie Co. in 1983. Although the Greensboro bakery is now closed, honey buns remain a best-seller for Flowers." Unlike cinnamon buns, which are generally the product of bakeries, honey buns are common convenience store and vending machine fare. Normally sold individually wrapped, alone or in boxes of 6 or more, they are a popular grab-and-go breakfast, eaten cold or heated in a microwave oven. A variant of cinnamon scroll is coffee scroll when topped with coffee flavor fondant. Recipe for cinnamon roll see Here, Here and Here.